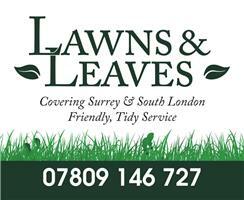 Lawns and Leaves - Garden Services, Rubbish/Waste/Clearance based in Carshalton, Surrey. As well as domestic properties I also offer some if not all these services to estates, schools etc. I have 5 years of experience working for myself doing the above but prior to that I shadowed my mother who has been gardening since the seventies and is still going strong. Working with her has given me a wealth of experience and set me up well to venture off with my own business. Instead of spending a fortune on completely landscaping your garden I can often be cost effective by working with what already exists. For example, in many of the photos I have in my gallery I've strimmed and mown overgrown gardens to reveal what looks like dead brown grass underneath but is usually perfectly healthy grass and only needs a good drink to recover! This can save you hundreds of pounds by not having to returf the garden. All equipment is powered by petrol and no electricity is required. I try to be as environmentally friendly as possible using Swedish petrol called 'Aspen' which gives lower emmissions.